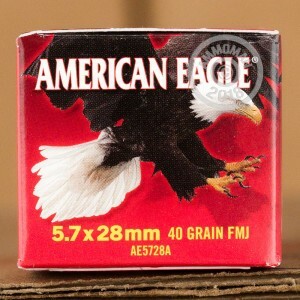 This Federal American Eagle 5.7x28mm ammo is a great buy for your FiveSeveN firearm. 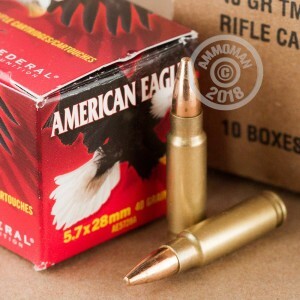 Loaded using brass casings, and non-corrosive Boxer primers, they are a great alternative to the more expensive SP and HP rounds. In addition, they are ballistically similar to the more expensive SS197SR rounds. The TMJ (Total Metal Jacket) bullet completely encases the lead core so this round will be welcome at the “green” and indoor ranges that require this feature. 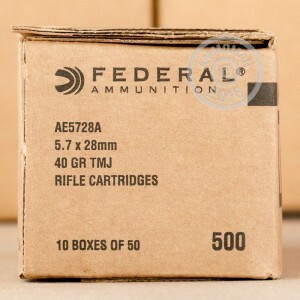 Generating 1655 fps and 243 ft/lbs of energy at the muzzle, these rounds shoot great, and are a great bargain! Remember! All single orders totaling over $99 will get FREE SHIPPING from our door to yours, so stock up and save even more!